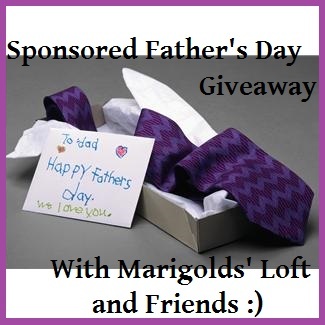 Marigolds' Loft: Some Great Exposure for Father's Day! Father's Day is less than a month away, and since I had so many wonderful people sponsor the Mother's Day Giveaway - I thought it would be only fair to offer something similar for all the daddies too - or for the mommies to win some cash to buy daddy something! As the dads don't knit, this Giveaway will be a cash pot giveaway. This means that all money collected from the sponsors will be added to the pot. (That said, if you have a great idea that you think would fit perfectly for the Giveaway, send me an email - I am open to all suggestions). Like with the Mother's Day event, you will be introduced on the Giveaway page :), and added to my side bar with many shout outs on all my social sites. With as little as $5.00 you can also take part. You have the chance to sign up for this sponsored event until the 20th May. You can book your spot by filling out this form. I love your background it is soooo pretty.